Jordan and I recently had the opportunity to interview the director Randall Miller about his new movie Bottle Shock, which the Winos are screening on Thursday night at the Landmark Theatres (discounted tickets are available until tomorrow — click here). The movie tells the story of the Napa winemakers whose entries shocked the wine world at the infamous “Judgement of Paris” in 1976. We spoke to Miller about his feelings towards wine, the process of recreating 1970’s Napa, and the challenges involved of making a wine movie appealing to young audiences. 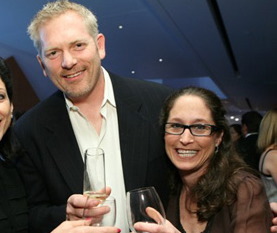 Miller with his wife and co-writer/producer, Jody Savin. YW: This is the story of a wine event that took place a quarter-century ago, and that most Americans have never even heard of. Would this film have been possible five or ten years ago, or do you sense an increased enthusiasm for wine in popular culture that allows a film like this to be made? For us to want to put a year and a half of our lives into a movie, there has to be a really interesting story there, something that has importance to people. One thing that these Napa winemakers told us was that the three most important things to happen to the California wine industry were Phylloxera, the Judgement of Paris, and Sideways. What’s fascinating about these guys is that they’re still basically farmers. They drive up in their pickup trucks, and they talk about it like it’s agriculture. They’re certainly pleased when their wine sells, but when it boils down it, they’re still farmers. YW: Was there a consciousness on your part that some or even most of your audience might not know a lot about wine? How did that play into your decision-making as you wrote the script and edited the movie? RM: Whenever you tell any story about a specific subject like this, you have to be careful to be authentic for the fans of any particular subject — but ultimately the public wants a story in which they can identify with the characters. They want to be able to superimpose their lives onto the characters and the story, and to be able to relate with them. It has to do with wine, yes, but basically it’s a human story. You can talk about Sideways the same way; it’s essentially a story of these two guys who have experiences together. If the movie manages to inspire anyone about wine, then it’s a real compliment to me as a filmmaker. It’s gratifying, the idea that I can give people this feeling that they’re interested in leaving and going and buying a bottle of wine. As a filmmaker, you want your story to have a lasting effect on people. YW: To what degree was the film a learning process for you? Were you a wine aficionado already, or did you need to study up? RM: Well, we’re indie filmmakers, so we of course love great wine, but can’t really afford great wine. We’d sort of been “twelve ninety-nine and below at Trader Joe’s” type folks. Now we’ve become slightly more snobby, I think. We’ll open a bottle of something and kind of think, hmm… and then move on to the next bottle. YW: As anyone who’s been there knows, Napa Valley is a far different place now than how your movie depicts it to have been in 1976. As a filmmaker, in what ways did you attempt to address that chasm in an aesthetic sense? How did you visually recreate such a different time in that region’s history? RM: There are a lot of things we did. We looked at a lot of photographs, we looked at a lot of historical evidence about the place and time. We didn’t shoot in Napa proper, we shot up in Calistoga, and we used Sonoma square to double for old Napa. We tried to avoid anything that had any kind of timestamp. As far as the wineries, we wanted to have more of that dirt-road feel that the time period had. They had paved roads and all, but it hadn’t become high-end like it is now. So we shot down in Carneros, we shot at Kenwood, we shot in other places; we were just really careful. Luckily, the vistas, the rolling hills and that aspect, aren’t going to change long after we’re gone, as long as they still have wineries. It still looks like that, and that’s timeless. The beauty of the vines on the hills… you can find that in Tuscany, you can find that in France, and it’s going to look the same, hopefully for hundreds of years to come. The idea was to create a soundtrack that was relevant to us today and that we’d like to listen to, and that also had a Northern California sound. Doobie Brothers were out of northern California, the Dead were out of northern California… so we tried to use that music exclusively. YW: As young wine drinkers, we’ve never known a time when Napa Valley wasn’t a region that carried a huge amount of weight and prestige. And we weren’t even alive when the Paris tasting took place. YW: I know… we’re children. In what way, then, were you conscious of the fact that there might be a disconnect for younger viewers who don’t have the historical perspective, and in what way did you attempt to craft a film that would resonate audiences of all ages? Also, I think that if you make the story so that it feels current even if it’s period, so that it feels current in terms of the emotion and the interaction, that’s the best way to include all audiences. The fact that these guys care about wine and that there was one particular event back in history is important, but it’s still a timeless story that exists in its own space. YW: When you explored the possibility of making this movie, and when you met these people — Bo Barrett, for example — did you find that they were itching to have their story told, or was it something about which they were sort of indifferent? But Jody and I left and thought: this is great. Here are these great, contentious characters — we can make a great movie out of these guys. We got them to sign the agreements, we made the movie last summer, and found out we were going to be in Sundance and all. And then later, at one of the film festivals, I met one of Bo’s sisters, who told me that at Thanksgiving dinner, this pallor had come over this table, and they were all like, “oh my god, what have we done? We sold our story over to these filmmakers. I hope it’s good.” Then they all came to Sundance, and they really liked it a lot. What’s really funny is that Jim and Bo have actually never boxed in real life. In real life, they fly fish together, and argue, but that’s another movie — that’s A River Runs Through It, so we weren’t going to do that. So we created this concept of them boxing, sparring with each other, because it’s a way to visually say, “this is their conflict.” But now, after the movie premiered at Sundance, Jim came out saying, “well, I in fact I actually did box a little bit.” Life and art start to blend, y’know? They really do like the movie a lot, and they had a big premiere up there for us a few weeks ago at Chateau Montelena. The characters are authentic in an aesthetic sense. There are pictures of Jim when he was about Bill Pullman’s age, and he looks a lot like Bill Pullman. Meanwhile, Bo is basically a 50-year-old surfer dude. He’s obviously at the top of his game in terms of wine, and he loves wine, but he’s also just a regular surfer guy. They make handcrafted wine, and we basically make handcrafted movies. From nothing, from just from an idea, comes a beautiful glass of wine — and from just an idea comes this movie. We make the movies on our own, I edit in my house with my kids running around… that’s how we do it, and we don’t do it for a lot of money. And the movie now comes out, and everyone thinks it’s this gigantic big movie, and that’s great, but it all started from a very small thing, just like their wine does. From left to right: cast members Alan Rickman and Rachael Taylor, Miller, and co-writer/producer Jody Savin.